We’d love your help. Let us know what’s wrong with this preview of Star Wars by Justina Ireland. When Lando Calrissian gets caught smuggling on the planet Hynestia, the queen agrees to let him go if he delivers something called the Solstice Globe to the Empire on her behalf. Lando is relieved that his punishment is a simple delivery mission—but he soon discovers things are not as si An all-new adventure starring Lando Calrissian and L3-37 onboard the Millennium Falcon! To ask other readers questions about Star Wars, please sign up. Very disappointed in this book. I am not even a big Lando fan, but even he deserves better than to be portrayed as a two bit con man at best, a grinning idiot with luck on his side at worst. I have no problem introducing new characters into the Star Wars universe, but I hate having established legends completely up staged but these characters. Lando comes across as a cape wearing pansy all style and no substance at all. He needs to be saved from every situation he gets himself into. In fact apart Very disappointed in this book. I am not even a big Lando fan, but even he deserves better than to be portrayed as a two bit con man at best, a grinning idiot with luck on his side at worst. I love Star Wars and the Star Wars universe. I'm not a mega fan like some people but I still like it and enjoy it very much. It is something I share with my kids and family. So when this book came up for review I was excited. Since I read some excerpts from the book and liked them I was even more excited. That being said... I really enjoyed it for the most part but towards the end it seemed to drag a bit. It almost seemed stuck. Which slowed down the book and the pace of it a bit. If you know Star wars you know the world and it was fun revisiting them.... the book also had some very awesome and fun illustration that I enjoyed. Overall fun great book.... though it has some slow moments. I was so excited to receive this one from Bookishfirst. I love Star Wars and I loved this one. It was a awesome cover. Well written by and established author that I already enjoy. This was geared toward Middle Grade but I think it can be enjoyed by any age. And by Sci fi lovers or Star Wars Lovers. This edition was a beautiful hardback book and it would be an great addition to anyone's Star Wars collector. Whether you are a Star Wars in general fan or if your favorite character is Lando you shou I was so excited to receive this one from Bookishfirst. I love Star Wars and I loved this one. It was a awesome cover. Well written by and established author that I already enjoy. This was geared toward Middle Grade but I think it can be enjoyed by any age. And by Sci fi lovers or Star Wars Lovers. This edition was a beautiful hardback book and it would be an great addition to anyone's Star Wars collector. 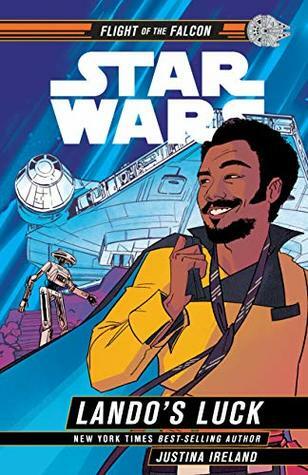 Whether you are a Star Wars in general fan or if your favorite character is Lando you should give this book a shot. >>Love the cover and few illustrations. >>Contains Cheeky Droid Navigator, Do Right Adventuress Princess and her badass Assassin Queen mom, spaceship fighting, color-changing alien cat species with three tails and a quest to save the world, pay off debts, and stave off the Empire for another day. >>And obvious Lando in all his GLORY. I will admit it still makes me do a double-take seeing Donald Glover as Lando. He's perfect, don't get me wrong, but I still have this moment of "I KNOW YOU! You belong somewhere else too!!". >>I think even people who don't like or care about Lando will enjoy this. I think *this* story is more of what people were looking for in the Solo movie. I listened to this book via Audible. It can be difficult to know what to expect when it comes to reading a children's book - it could be dumbed down and simplified or it could be something that is just more appropriate for younger audiences. Thankfully Lando's Luck falls into the latter category and is a perfectly fine Star Wars read for fans of all ages. It isn't said specifically when the story takes place, but it is certainly before the events of Solo: A Star Wars Story. Lando and L3-37 are sti I listened to this book via Audible. It isn't said specifically when the story takes place, but it is certainly before the events of Solo: A Star Wars Story. Lando and L3-37 are still cruising around in the Millennium Falcon, usually up to no good. And that's pretty much what happens here. Aside from the two main protagonists, pretty much everyone else is new to the galaxy far, far away. I found this refreshing, and it was nice to have some different faces. The characters do feel like they lack a little depth, which goes back to the target audience. In general though it was something I was easily able to look past. I enjoyed the story itself - we get to see new planets and meet new species, which is always fun. There are some nice twists and turns to keep you guessing and some very Star Wars-style action. When Lando Calrissian is caught smuggling valuable furs from the kingdom of Hynestia, he faces a choice: either sit in prison or help Princess Rinetta take the Solstice Globe back to the planet it belongs to. Always up for an adventure and running from those he owes money to, Lando reluctantly agrees to help Rinetta. Flying the Millennium Falcon with his loyal first mate L3-37, Lando takes his best shot at helping Rinetta and keeping himself out of the clutches of his pursuers. Will Lando's luck When Lando Calrissian is caught smuggling valuable furs from the kingdom of Hynestia, he faces a choice: either sit in prison or help Princess Rinetta take the Solstice Globe back to the planet it belongs to. Always up for an adventure and running from those he owes money to, Lando reluctantly agrees to help Rinetta. Flying the Millennium Falcon with his loyal first mate L3-37, Lando takes his best shot at helping Rinetta and keeping himself out of the clutches of his pursuers. Will Lando's luck win the day? I thought this book was so much fun, and since I am a Star Wars fan I really enjoyed it. Since I've seen the movie Solo, I enjoyed this book even more because I could picture L3 backtalking Lando as well as Lando cheating at the card table. I thought there was a great balance between humor and peril, the characters were vivid, and the dialogue was well written. The writing and the plot are just right for a middle grade novel, and I think kids would enjoy this book as well as older Star Wars fans. I highly recommend this book! Imgaine my delight when I was informed that I won this book. I'm a HUGE Star Wars fan since it first came out. I even read the books in the 90s'. I can never get tired of them. Lando happens to be one of the mysterious characters. I've always wondered about his past. I orginally thought I'd get some of the gist of his past and how he became the man he is. Unfortunately that didn't happened. But.....there a piece of his past which is told by a woman. The illustrations were wonderfully and tastefu Imgaine my delight when I was informed that I won this book. I'm a HUGE Star Wars fan since it first came out. I even read the books in the 90s'. I can never get tired of them. Lando happens to be one of the mysterious characters. I've always wondered about his past. I orginally thought I'd get some of the gist of his past and how he became the man he is. Unfortunately that didn't happened. But.....there a piece of his past which is told by a woman. The illustrations were wonderfully and tastefully done on the cover and inside the book. The kids will enjoy them. This story was so fun to read. It's perfect for middle graders and all ages! I'm older and I really enjoyed it. I saw that there is a collection which can be collected together. By the way, L3 was so my favorite. She cracks me up! Kudos to Justina Ireland! She's done it again! I will most definately read Solo and the other books to this collection in the future AND I will start reading more of Justina Ireland's books in the future also. This story would be more accurately titled "Princess Rinetta's luck". Not only due to many convenient plot points (expected for young reader), but surprisingly there was little need for Lando to be featured at all. Still, I did enjoy imagining his annoyed face as he encounters misfortune after misfortune. I also enjoyed the portrayal of L3, being more egregious than perfect. The villain, Queen Forsythia was diminished as the story went on, it felt as though the author had to make the Hynestians a This story would be more accurately titled "Princess Rinetta's luck". Not only due to many convenient plot points (expected for young reader), but surprisingly there was little need for Lando to be featured at all. Still, I did enjoy imagining his annoyed face as he encounters misfortune after misfortune. I also enjoyed the portrayal of L3, being more egregious than perfect. The villain, Queen Forsythia was diminished as the story went on, it felt as though the author had to make the Hynestians a people of good morals. What I did enjoy was the great world building, the side quest on Neral's moon, and the wonderful sense of adventure from Rinetta. Off the heels of Solo, a Lando Calrissian tie-in book is a no-brainer for Disney, and I think they picked exactly the right person to tell the tale in Justina Ireland. Lando's Luck is exactly what you would want in a middle-grade Star Wars book. It's got adventure, planet-hopping, firefights, whimsically imaginative elements, and an absolutely charming cast. While Lando is the titular character, the real scene-stealer is the secondary main character, a clever young princess named Rinetta who goes Off the heels of Solo, a Lando Calrissian tie-in book is a no-brainer for Disney, and I think they picked exactly the right person to tell the tale in Justina Ireland. Lando's Luck is exactly what you would want in a middle-grade Star Wars book. It's got adventure, planet-hopping, firefights, whimsically imaginative elements, and an absolutely charming cast. *Disclaimer* I received a free copy in exchange for an honest review. 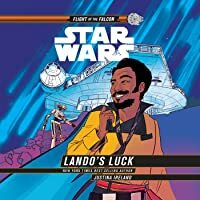 Lando's Luck is a middle grade Star Wars themed novel. Being a non Star Wars fan I was nervous that I would be lost with the characters, planets, and Star Wars vocabulary that is unique to the Star Wars world. My feelings were unfounded because Justina Ireland does a phenomenal job explaining the ins and outs of the universe. As unique Star Wars ideas are introduced she briefly explains them. The novel begins with Lando Calrissi *Disclaimer* I received a free copy in exchange for an honest review. The novel begins with Lando Calrissian, a gambler and smuggler with a reputation for swindling those that come in contact with him. When he is caught smuggling on the planet Hynestia, the queen makes him an offer he cannot refuse, bring the Solstice Globe to the empire. The problem is the Solstice Globe does not belong to Hynestia or the Empire. The adventure begins when Princess Rinetta makes Lando a different. This is the first of the Flight of the Falcon books, and it is a fun, quick read. When a bounty hunter is hired to acquire the Millennium Falcon, she has to find it first. It also helps to have an idea of what the ship is capable of doing. To that end, Bazine, the bounty hunter, seeks out a woman with a story about the famous ship. She pays for the story and hears the tale of a princess that happened to meet Lando and L3-37 at a time when the Falcon was in their possession. This is a fun adventure. Star Wars fans get to learn about a few new planets in the Star Wars galaxy as Lando’s adventure unfolds. There are chases, escapes, fire fights, and a little political intrigue plus enough scoundrel antics to satisfy any Star Wars fan. I would be curious to have my daughter read this one and see if she likes it better than I do. Typically I enjoy the young readers Star Wars books just as much as the "adult" books but this one left me a little bit cold. The plot is pretty predictable all along the way, Lando seems to be an afterthought to the story, L3 has almost no part at all. The new characters aren't all that memorable and the stakes never seem particularly high on the adventure. The framing story with Bazine is probably more intriguing in the end than the story that it frames. I think Justina Ireland did a great job capturing Lando's personality in the small tidbit I was able to read. In the chapter I read, it was spunky and fun, though in all reality not a lot was going on, it was just a simple Sabacc game with airs of something more. I really enjoyed the hints of something bigger about to happen, and even though I don't particularly enjoy Middle-Grade novels, for I find they typically talk down to the reader as if they are too dumb to understand what's going on, this book didn't feel like that too me, this felt more like the writing style was more YA, but the contents, at least of what I was able to read, was fairly Middle-Grade. I'm a fan of Star Wars movies, especially the movies released first as the characters were snarky, fun, and bantered with great chemistry. When I saw a book from the point of view of Lando Calrissian, a character that only played a smaller part in the movies, I knew I had to check it out. Plus, Justina Ireland!!! And I wasn't disappointed. This book has fun characters from different worlds, an intelligent droid, and all the banter I loved from the original movies. The action really picks up in th I'm a fan of Star Wars movies, especially the movies released first as the characters were snarky, fun, and bantered with great chemistry. When I saw a book from the point of view of Lando Calrissian, a character that only played a smaller part in the movies, I knew I had to check it out. Plus, Justina Ireland!!! And I wasn't disappointed. This book has fun characters from different worlds, an intelligent droid, and all the banter I loved from the original movies. The action really picks up in the second half of the book and the reading pace sped up for me. The space adventures will have all science fiction middle grade fans cheering on the unlikely crew of the Millennium Falcon until the end. Librarian: As a children's librarian purchasing this book for the collection is a bit of a no brainer. Star Wars is immensely popular among my patrons (especially the boys) and they devour everything we get on the subject. The fact that this time out we get a story of Lando and L3 written by the always fabulous Justina Ireland? Icing on the cake. Reader: I have read nearly all of the new Star Wars expanded universe books, and a decent percentage of the old expanded universe (now called Legends). Librarian: As a children's librarian purchasing this book for the collection is a bit of a no brainer. Star Wars is immensely popular among my patrons (especially the boys) and they devour everything we get on the subject. The fact that this time out we get a story of Lando and L3 written by the always fabulous Justina Ireland? Icing on the cake. A good fun Star Wars tale. Just don't expect anything too deep, it is a "junior" title. But, I did enjoy listening to it. I really enjoyed hearing more about Lando, but when the story shifted to the other character I felt a little distracted. Not that it wasn't fun, it was that I wanted MORE Lando. The story starts with a minor character from the Force Awakens: Bazine Netal. Now, I liked the story she was in, so I was excited to hear more about her. BUT... she's just in there to be in there. Alt A good fun Star Wars tale. Just don't expect anything too deep, it is a "junior" title. But, I did enjoy listening to it. The story starts with a minor character from the Force Awakens: Bazine Netal. Now, I liked the story she was in, so I was excited to hear more about her. BUT... she's just in there to be in there. Although, it does make me wonder when this part of the story takes place with her in the overall timeline. My boys and I enjoyed this book for the most part. It was quite verbose in my opinion. The language even difficult for a middle schooler. That’s Star Wars for you though. I think the story is made for a elementary or middle schooler but it would be difficult for them to read. We decided in the end it didn’t have quite enough action and the story lagged a bit at times. The boys enjoyed L3-37s snarkiness. She was quite the handful but entertaining. While I wouldn’t necessarily recommend this book it My boys and I enjoyed this book for the most part. It was quite verbose in my opinion. The language even difficult for a middle schooler. That’s Star Wars for you though. I think the story is made for a elementary or middle schooler but it would be difficult for them to read. Lando's Luck is an entertaining and high-energy story for middle-grade readers. Whether a Star Wars fan or simply a reader looking for a little variety, this stand-alone story doesn't disappoint! The vivid descriptions of the Star Wars universe couple well with the fast-pace narrative, and of course the bravado of our (second) favorite smuggler. Middle-grade readers will appreciate this high interest read -- especially because the text is supported by beautiful in-text illustrations. Before Land Lando's Luck is an entertaining and high-energy story for middle-grade readers. Whether a Star Wars fan or simply a reader looking for a little variety, this stand-alone story doesn't disappoint! The vivid descriptions of the Star Wars universe couple well with the fast-pace narrative, and of course the bravado of our (second) favorite smuggler. Middle-grade readers will appreciate this high interest read -- especially because the text is supported by beautiful in-text illustrations. I love Star Wars and this book was just a fun little story about a really cool character. It was interesting to learn more about Lando since I don't know much about him past what I've seen in the movies. The female lead was pretty interesting as well, but it is another of those stories that seems kind of farfetched for a child under the age of 15 is able to make a huge difference in a world where the adults should be way more than capable to outsmart and beat a child's mind. That being said, the I love Star Wars and this book was just a fun little story about a really cool character. It was interesting to learn more about Lando since I don't know much about him past what I've seen in the movies. The female lead was pretty interesting as well, but it is another of those stories that seems kind of farfetched for a child under the age of 15 is able to make a huge difference in a world where the adults should be way more than capable to outsmart and beat a child's mind. That being said, the story was still pretty good and I liked reading more about the Star Wars universe. I'd love to read more things like this and see what more is out there in that universe. Lando would be a fun character to keep following. Like the cover suggests this one follows Lando on an adventure that is perfect for all ages. My younger sons enjoyed the plot and the simplicity of the read. While it seemed like it went on a bit at the end overall the characters were a great addition to the greater star wars world. Lando acted like you would expect from his younger self and created good humor and good interactions. It felt great to see him by himself doing his own adventures without needing the more major characters. Highly rec Like the cover suggests this one follows Lando on an adventure that is perfect for all ages. My younger sons enjoyed the plot and the simplicity of the read. While it seemed like it went on a bit at the end overall the characters were a great addition to the greater star wars world. Lando acted like you would expect from his younger self and created good humor and good interactions. It felt great to see him by himself doing his own adventures without needing the more major characters. This was my first Star Wars book and it did not disappoint. I read this out loud to my son, who is just starting to get into Star Wars, and we both enjoyed it very much. A young Lando was fun to get to see and I loved all the different characters in the Star Wars world. And I LOVED that once again, in the Star Wars universe it is the women who must save the men from themselves. In this way, Justina Ireland completely captured all that Star Wars has meant to me over the years, because even though This was my first Star Wars book and it did not disappoint. I read this out loud to my son, who is just starting to get into Star Wars, and we both enjoyed it very much. A young Lando was fun to get to see and I loved all the different characters in the Star Wars world. And I LOVED that once again, in the Star Wars universe it is the women who must save the men from themselves. In this way, Justina Ireland completely captured all that Star Wars has meant to me over the years, because even though they are action, geared towards men, the woman prevail, and manage to make the men think it was them. I look forward to checking out some of Justina's other books, so four stars from me.